As you have probably come to realize, The Netherlands is a country that cannot make up its mind when it comes to the weather. The day could begin with the sun shining and a light breeze that makes your morning ride to uni pleasant and bearable. Then next thing you know, the sky has turned grey and the tiny rain droplets, you though would quickly pass, have turned into a light rainfall and then a full-on rainstorm. Though it’s unpredictability is annoying to say the least, we’ve just got to accept this country the way that it is and not let it discourage us. We must fight the rain and the only way to do so is to constantly be prepared! As simple as it sounds, many of us often forget to bring our trusty umbrellas. In case you got tricked by the clear skies or you forgot to wear a rain jacket one day, a foldable umbrella in your bag will be a life saver. By always having an umbrella you will always prepared for the unpredictable weather! If you do happen to have a rain jacket because you started doubting the weather after being tricked multiple times, congrats, you are 5 steps ahead of most us. However, rain jacket + umbrella = extra protection, so it’s not a loss! Continuing with the umbrella tip, biking with an umbrella in one hand whilst steering your bike with the other, is the ultimate Dutch skill everyone needs to learn asap. It is a skill so valuable, it should probably be on your CV! If you have ever wondered how the Dutch look so dry and composed as they climb the stairs of Polak, whilst your drenched from head to toe, this is probably how they do it. If the thought of biking in the pouring rain makes you want to cry, using the 9292 app will instantly brighten your mood! 9292 is a public transportation app which gives information of what form of transportation to take and at what time. By using it you can check which public transports you can use to get where you need to be. Making sure your bike is securely locked in a safe place, you can happily walk to the nearest tram/metro/ bus stop and avoid being soaked by the rain. If you do take public transport on the regular, using the 9292 app to check if the weather conditions have affected the tram times, will be a major time saver and it will help you from unnecessarily waiting in the rainy cold. Instead of having to YouTube “rainy mood’, use the live sound of rain pouring as background noise / music to help you focus on the assignments or reading you’ve been leaving to the last minute ;). Lastly, if you tried it all and still managed to arrive home soaking wet, it is okay, just accept your fate. Get rid of all your wet clothes, slip into something warm and comfy and binge eat comfort food as a way to forget the traumatizing experience that is biking in Dutch rainstorms. If you need help deciding what to eat, why not read our last blog post on 5 Dutch foods to try! 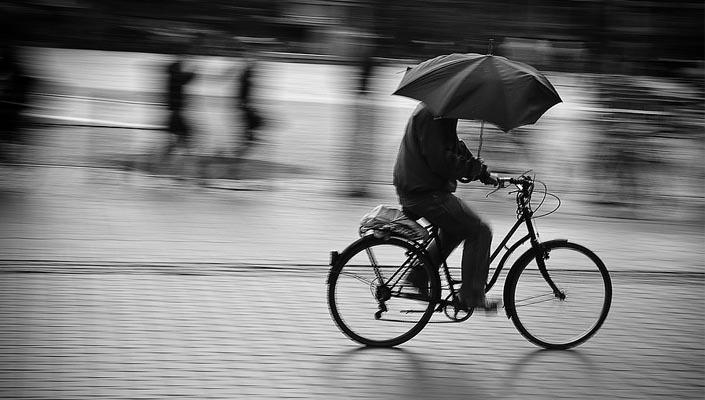 Here were 5 tips to survive rainy Holland. Got suggestions? Leave them down below!